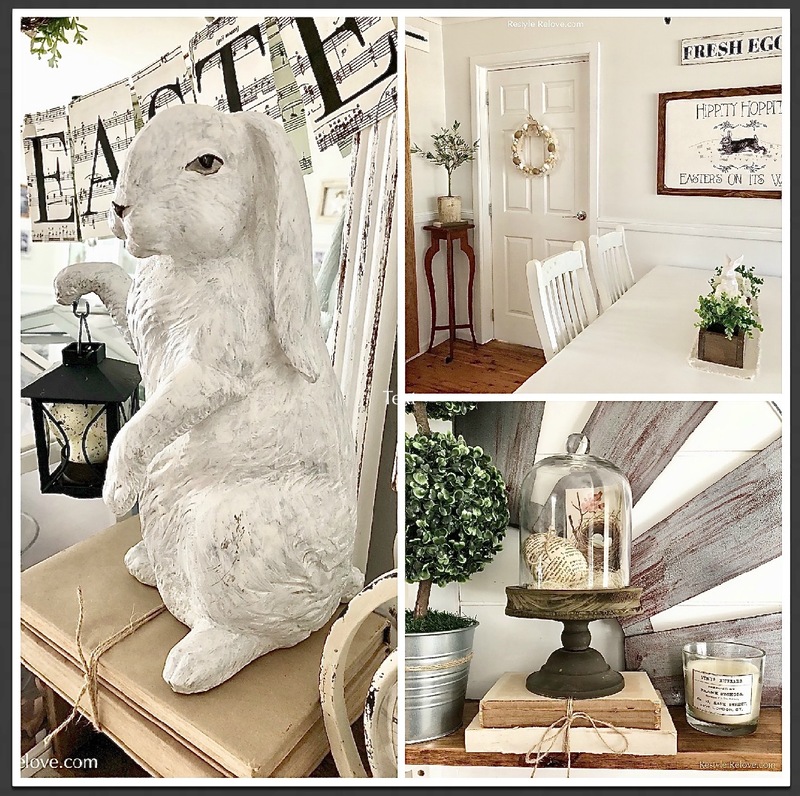 Welcome to my 2018 Easter Home Decor Tour! 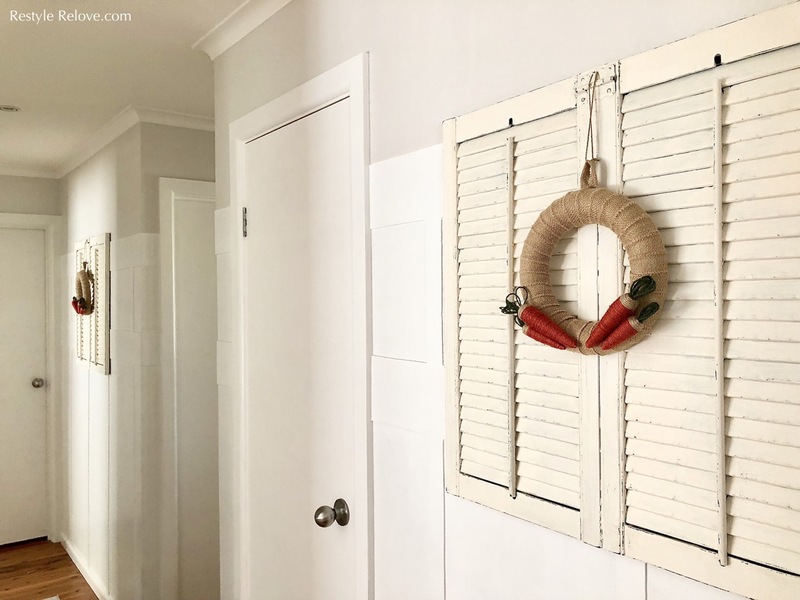 I've been promising and promising this post, but like Christmas, I seem to find it hard to stop decorating! Everything seems to go on sale and I have to find somewhere to put it before I do all my lovely photos. You know how it is. 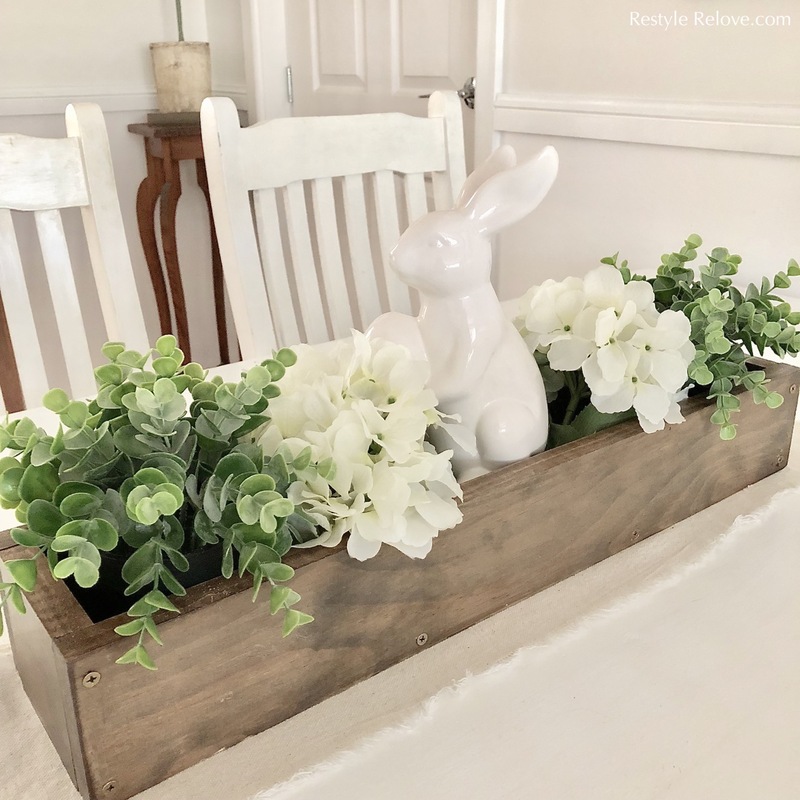 To change up the centrepiece on my dining table, I added a white ceramic bunny to my wooden box. 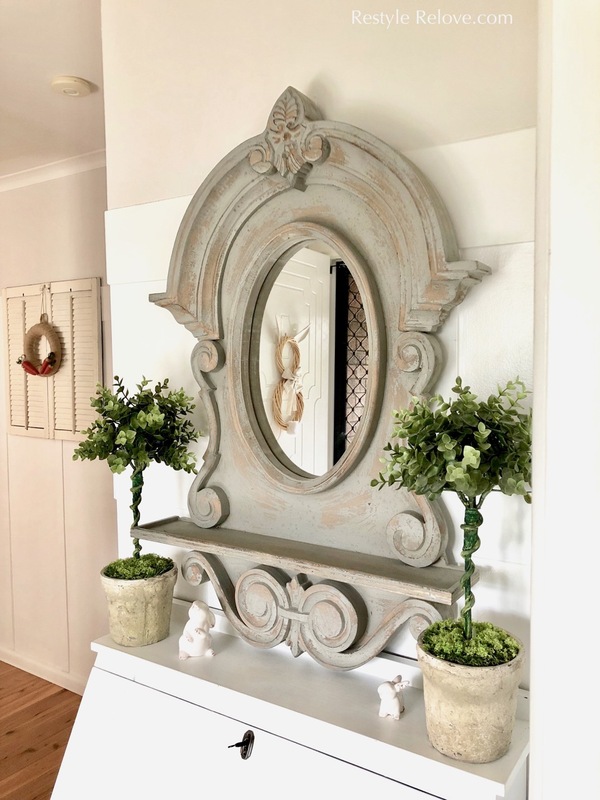 I kept the original flowers and most of the greenery. 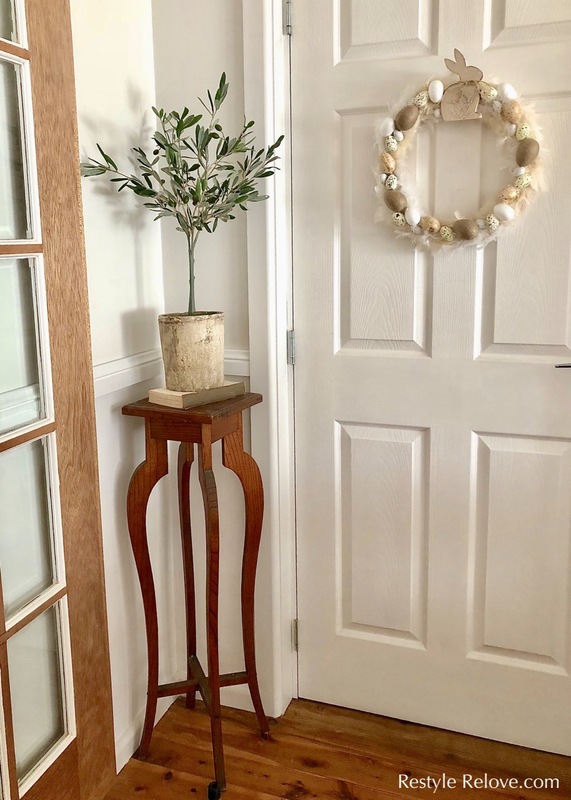 Simple but elegant. 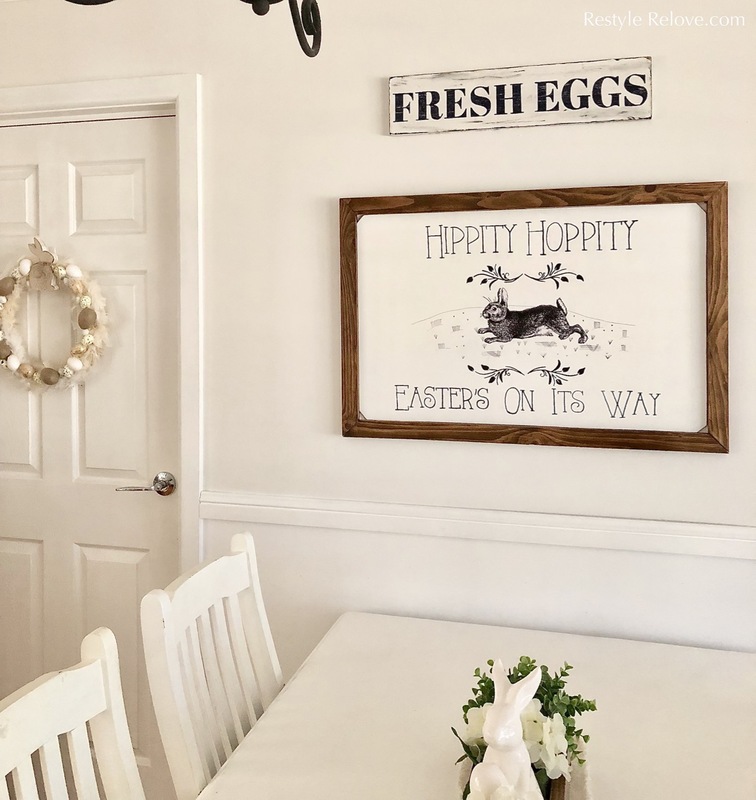 Here is my DIY Hippity Hoppity Easter sign that I recently shared. 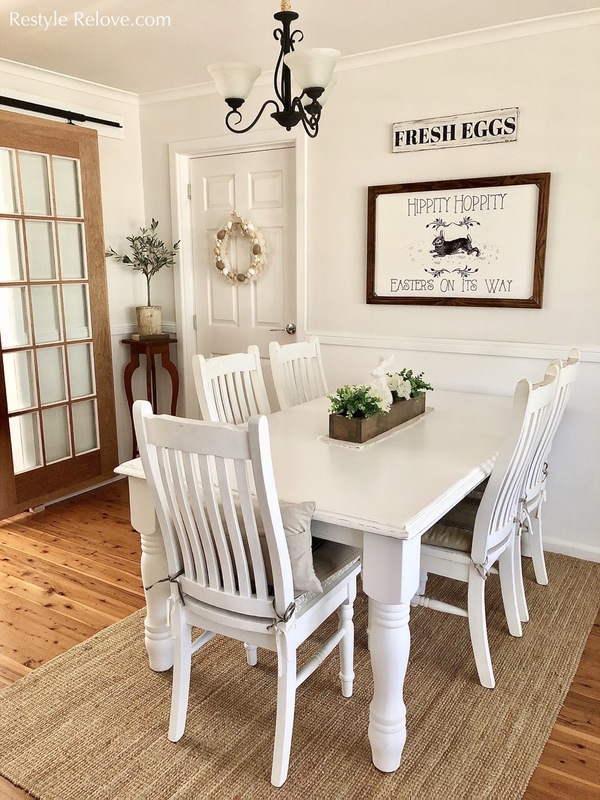 It's a great addition above our dining table. 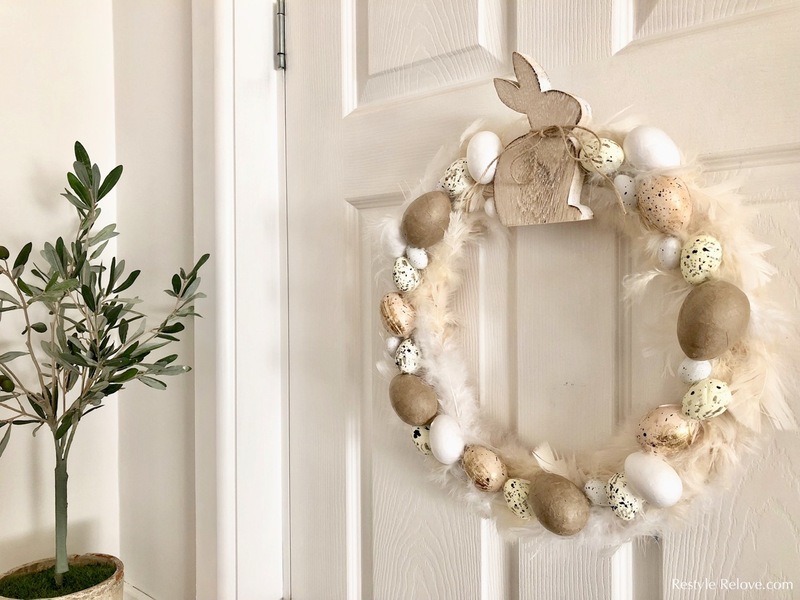 For the door leading to our garage, I created a new Bunny and Egg Easter Feather Wreath. I'm so happy with how it turned out. Definitely a keeper. 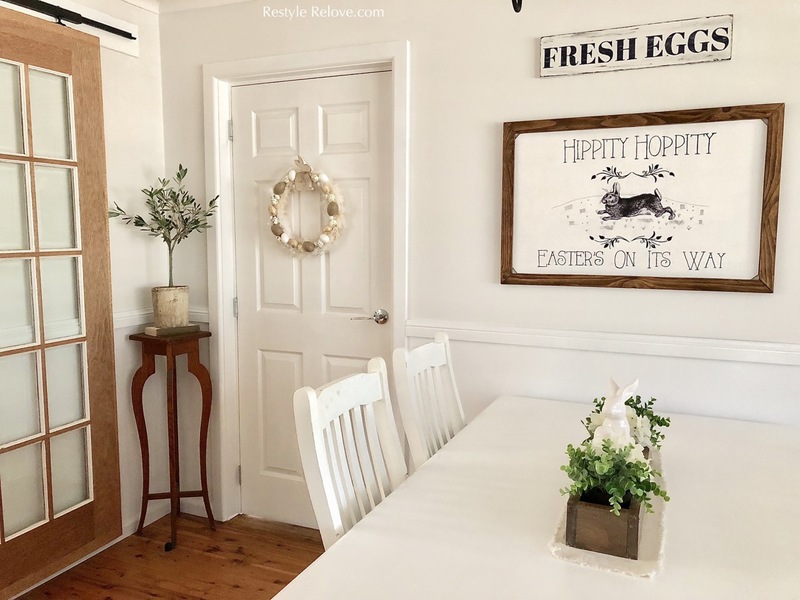 On the sideboard in the dining room, I hung my DIY Old Music Sheet Easter banner I made a few years ago across the mirror. 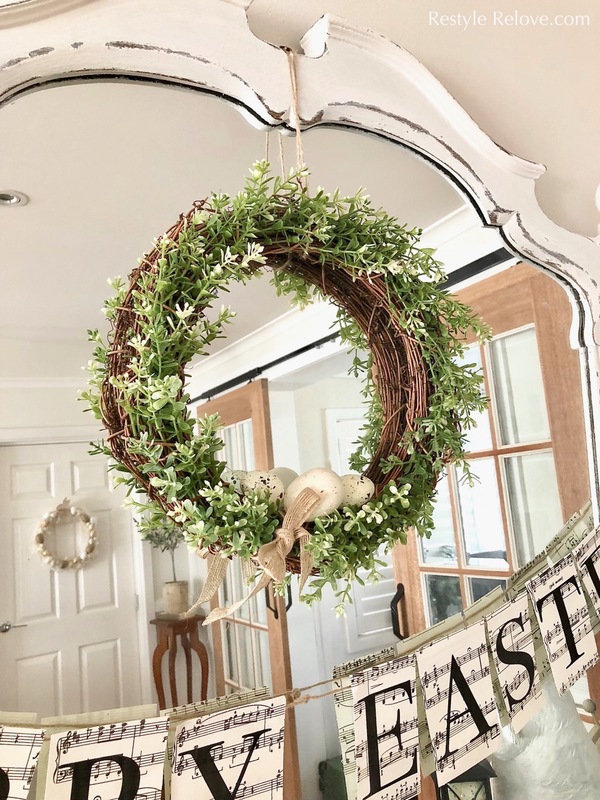 And here is my new Spring/Easter Wreath that I recently shared with you also. 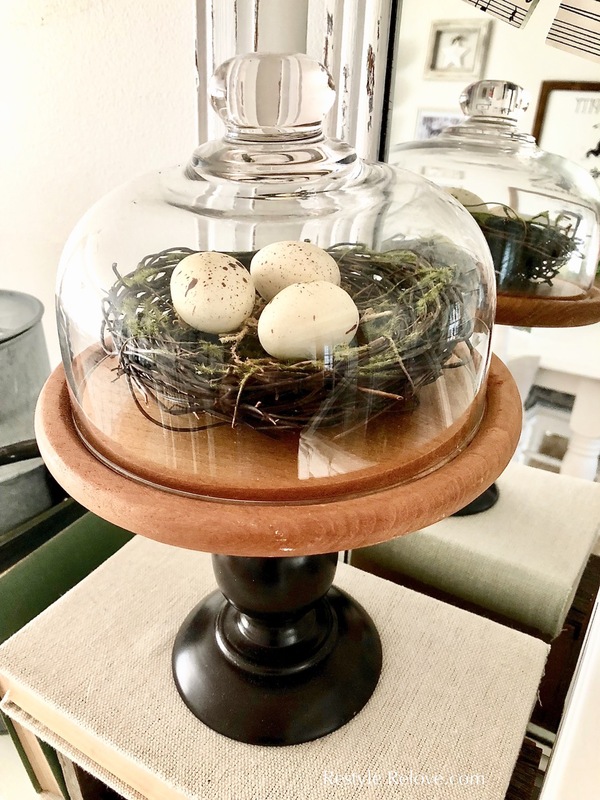 On my sideboard your find this cute cloche holding a sweet little birds nest, complete with eggs. 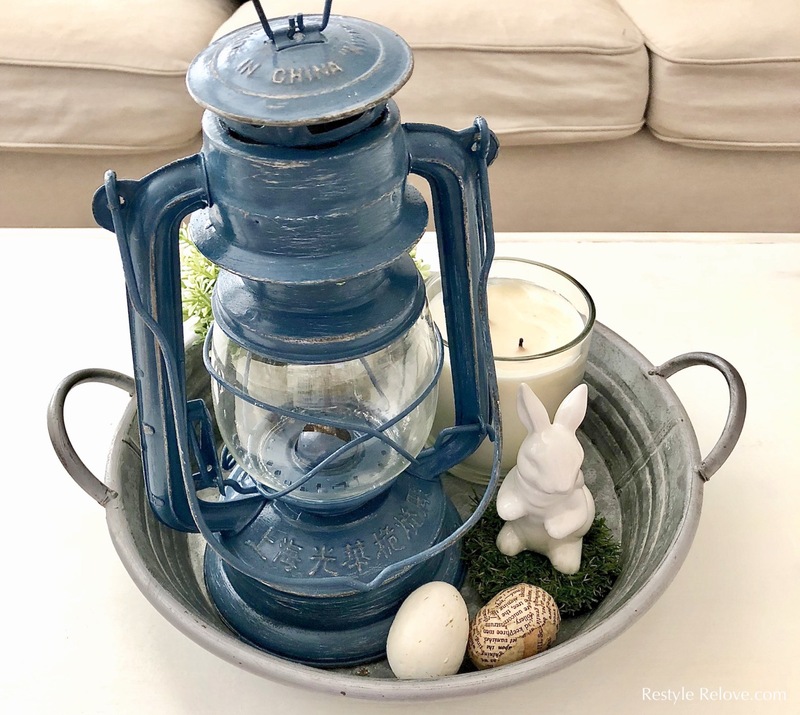 And the other side of the sideboard is my large ceramic rabbit with lantern I got a few years ago. Also on the mantel I added to my birthday cloche a DIY old book page egg and a sweet vintage nest picture I printed off the computer. 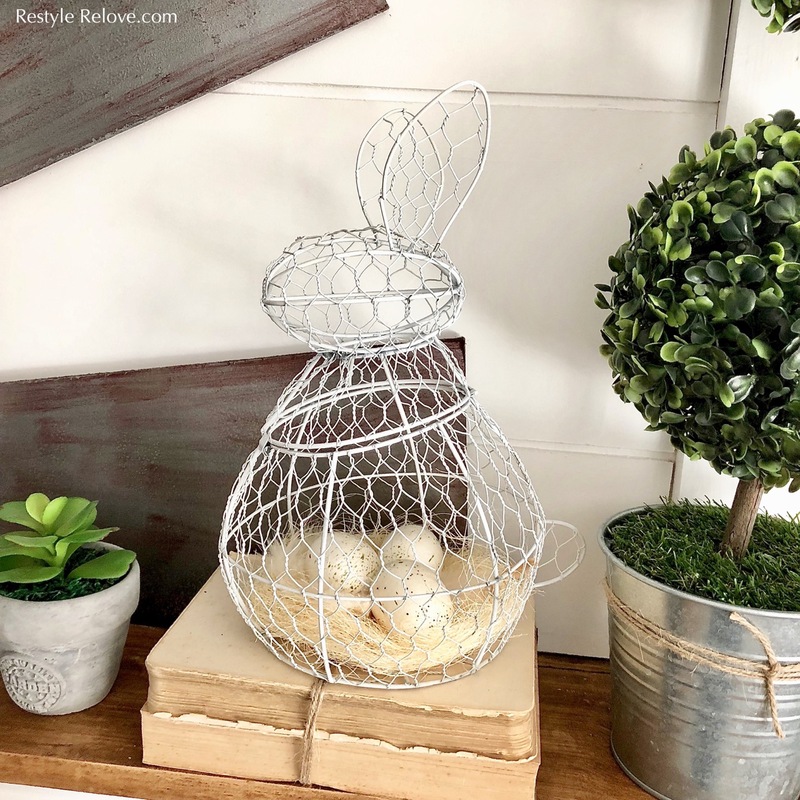 My white chicken wire bunny is on the other side. 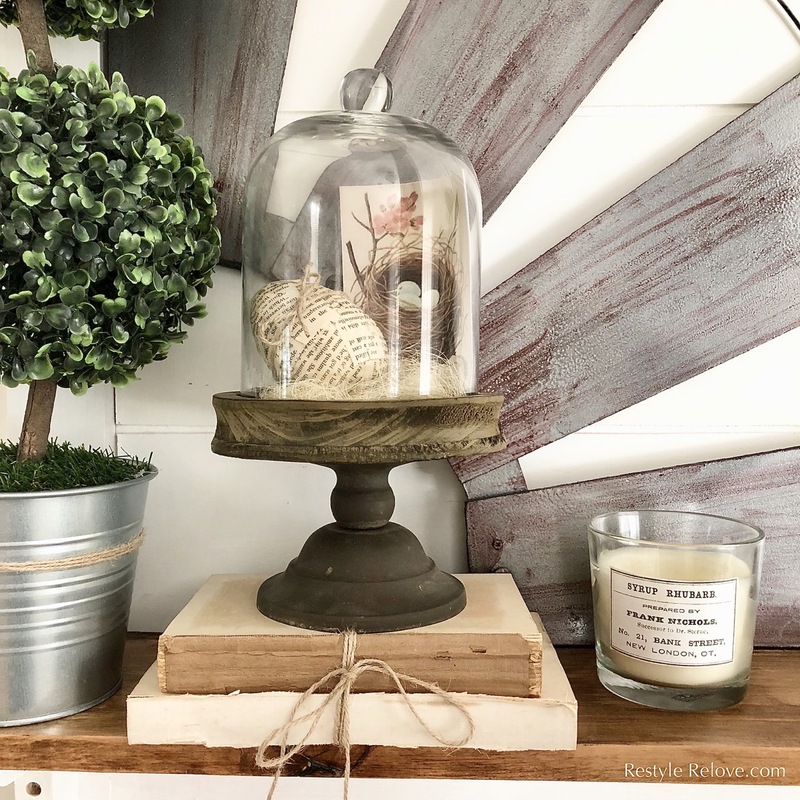 On my glass display cabinet I hung this cute ornament I recently purchased from Bed Bath n' Table. 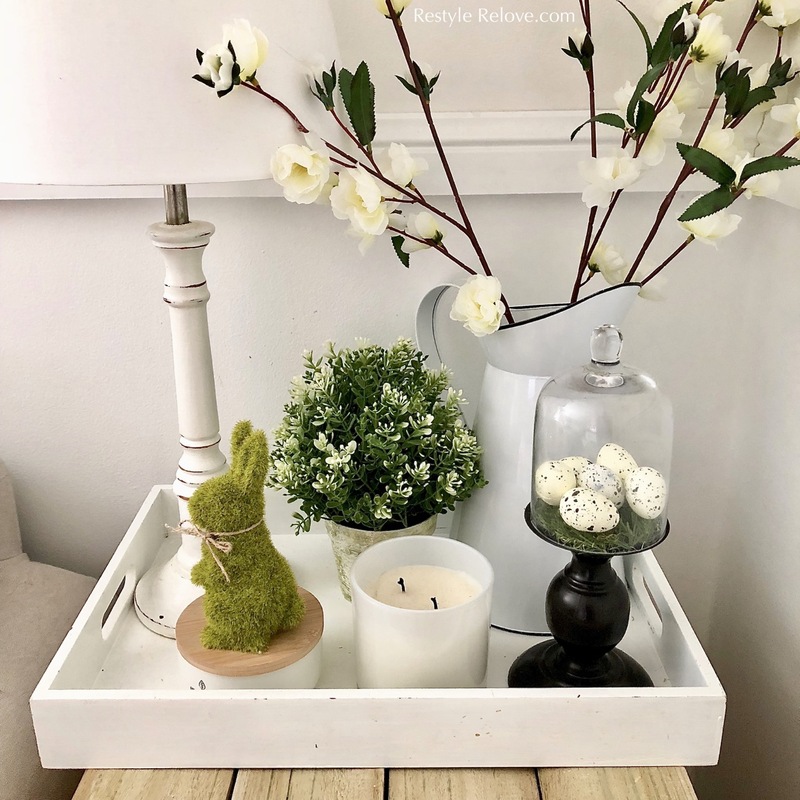 On the coffee table I added a white ceramic bunny with a couple of cute little eggs. 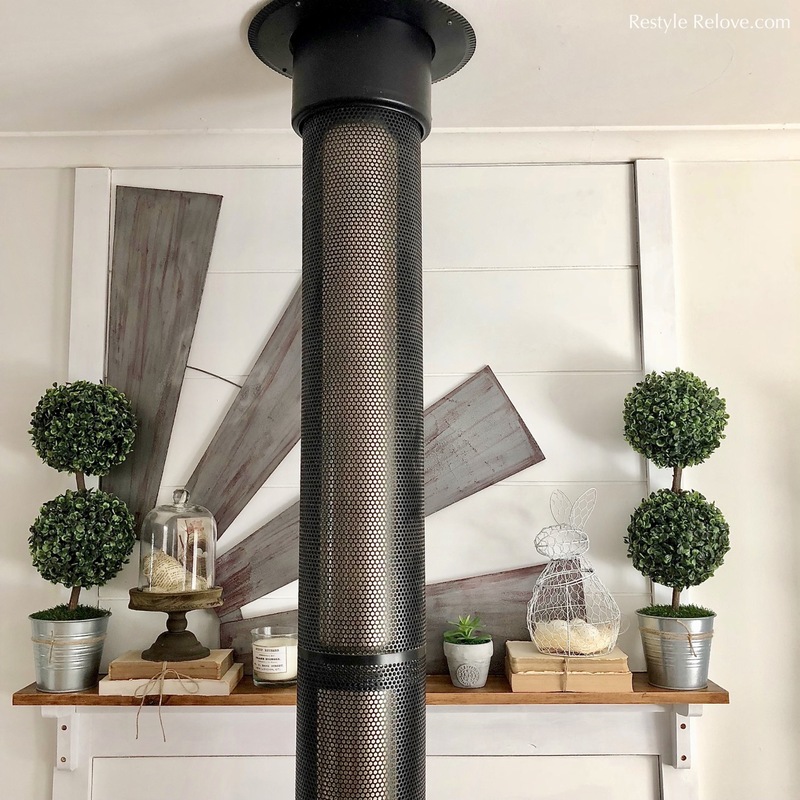 Again, subtle but keeping with the theme. 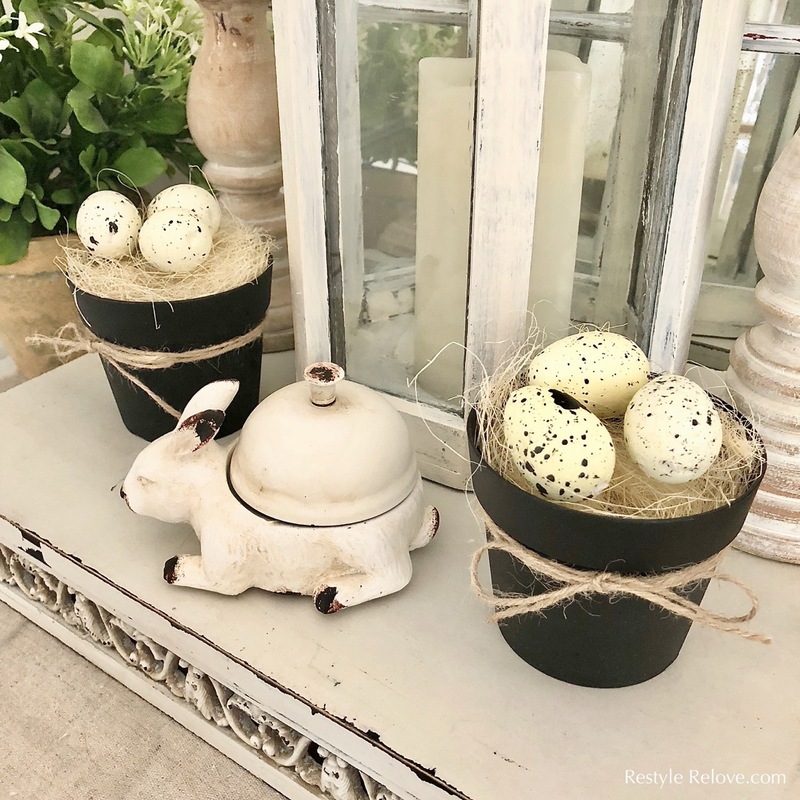 And on the cabinet next to the TV I added some little speckled eggs in some little black Ikea pots, wrapped with jute twine. 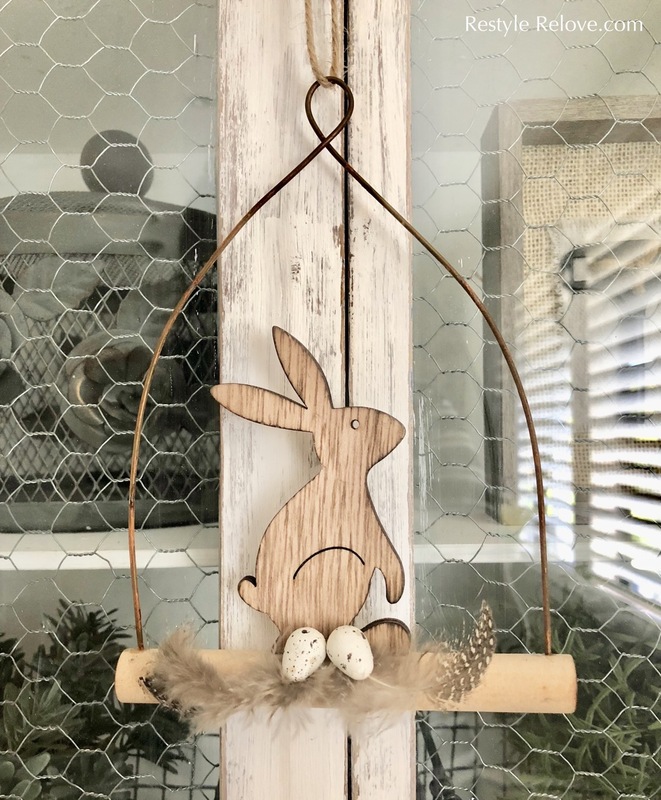 And who can forget my cute little bunny bell from Habitania which I recently shared on Facebook. 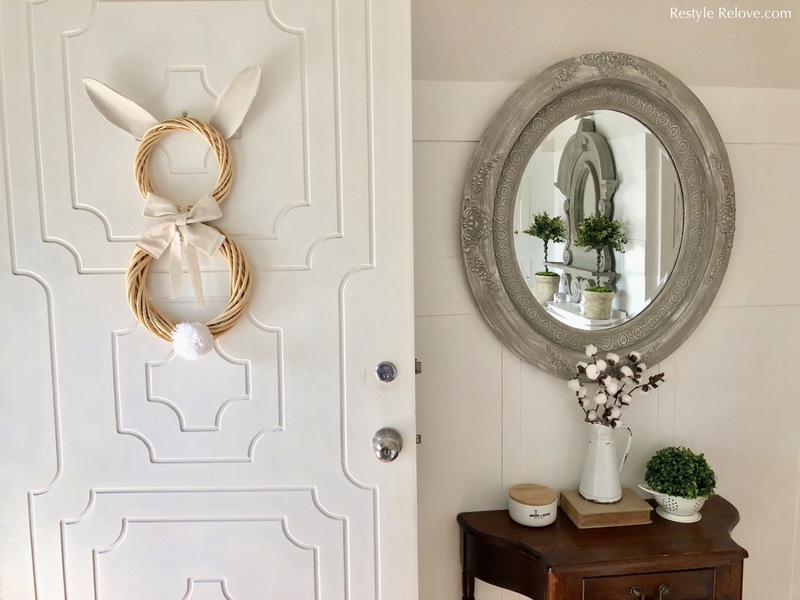 I hung my DIY wreath bunny on the front door. 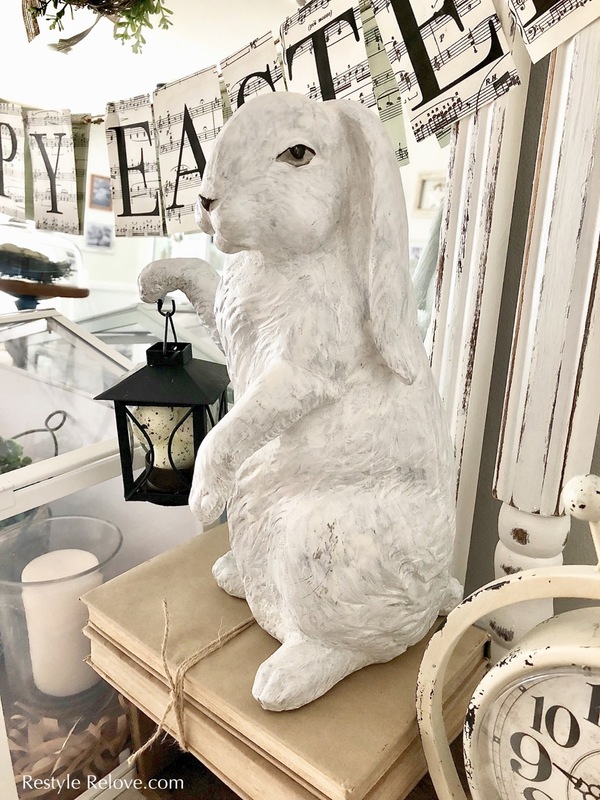 And on my vintage secretary I have two speckled white ceramic bunnies. 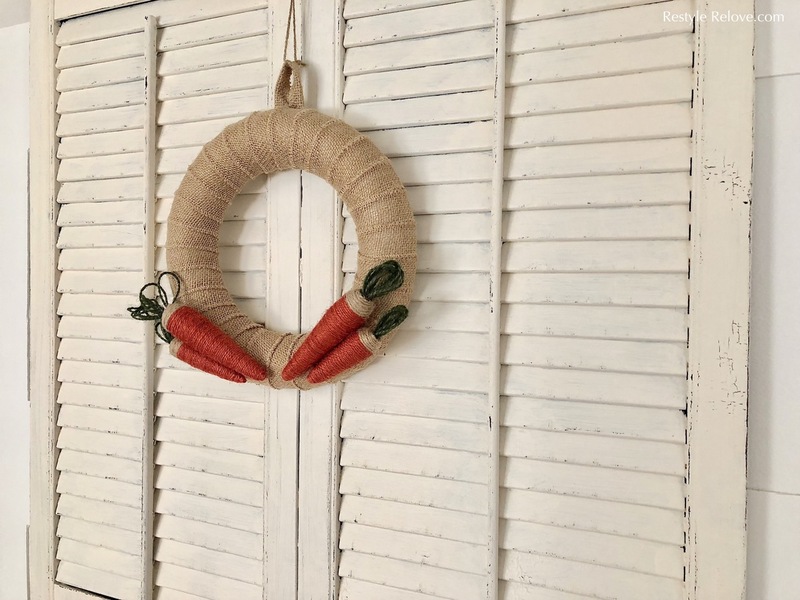 I found these cute jute wreaths at Bed Bath n' Table for half price, and hung one on each of our hallway shutters. Aren't they just adorable! 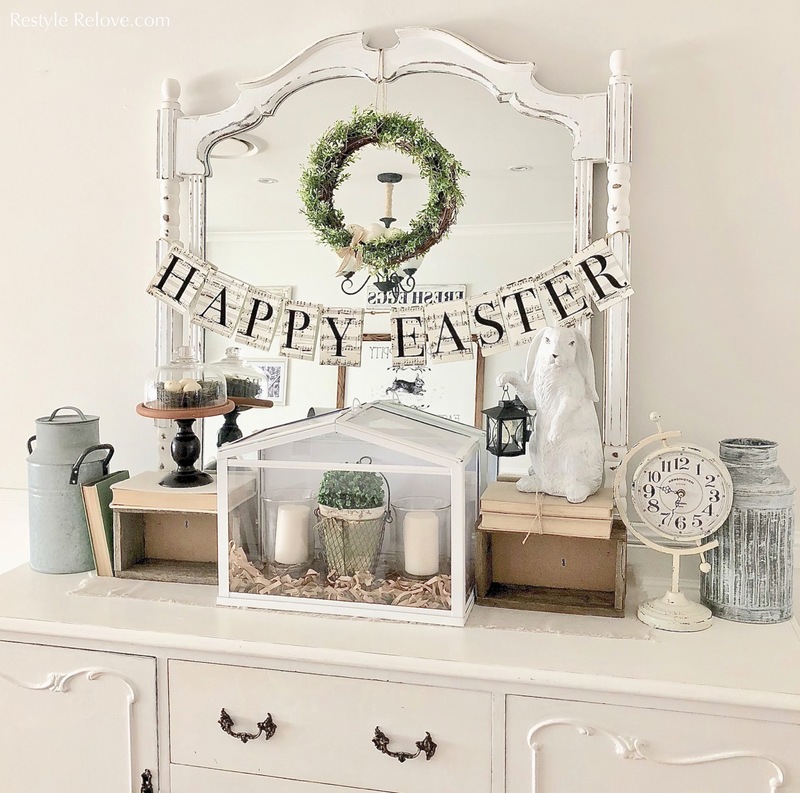 And that concludes this year's Easter decor. 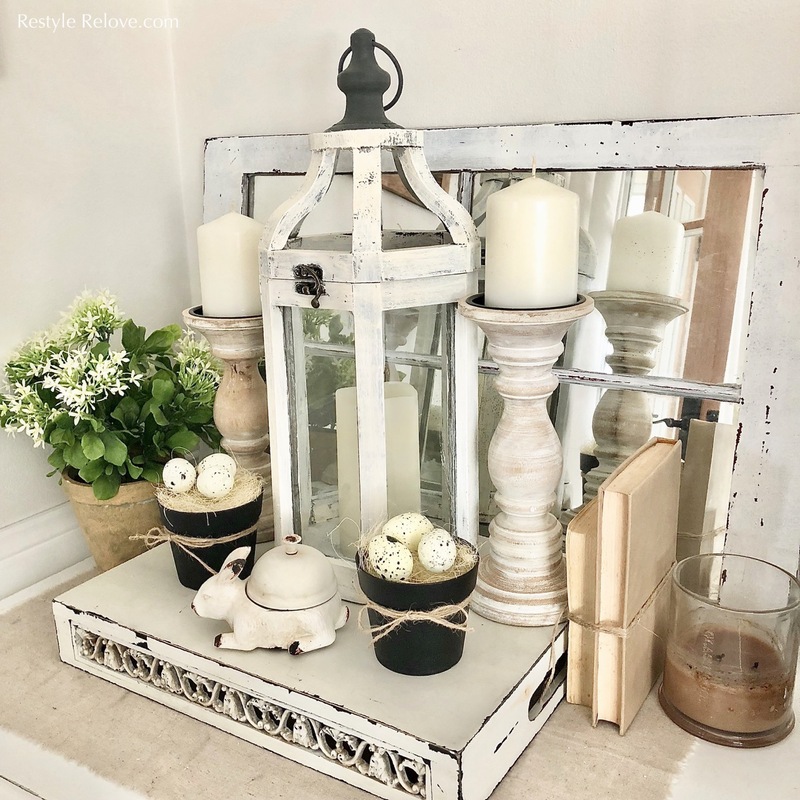 make your centerpiece. I will have to look for a bunny still.